Penguins are nature’s avian joke, birds that can’t fly but could win underwater speed records. They’re also horribly photogenic, disgustingly cute, and downright fragrant. ALL SEVENTEEN (OR nineteen, depending on classification system) species are native to the Southern Hemisphere. If you’ve always wanted to get a little closer to these wobbly creatures, here’s a quick guide on where to go to get down and dirty (watch your step — that’s guano). On an Antarctic cruise with no landings, for which you’ll likely pay upwards of $4,000, the adelie, chinstrap, gentoo, king, rockhopper, and macaroni penguins you sight will be just that — sightings. Through binoculars, they’ll look like black dots against the icy background. If you spring for landings with walks among the penguins, expect to drop up to 10 grand. Encounters will be plentiful, though you still won’t see the emperors of March of the Penguins fame. They’re high atop the ice shelf and far from the average Antarctic tourist’s view. Though not quite as far afield as Antarctica, the Islas Malvinas (Falkland Islands) aren’t really on the way to anywhere. That said, if you relish the idea of an up-close visit to a rockhopper colony, Saunders Island in the Falklands is a great place to go. 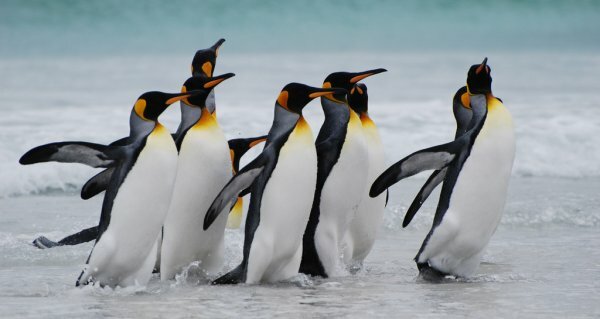 But the most photographed birds of the Falklands are the king penguins, a smaller version of the emperor, which have a breeding colony at Volunteer Point, a day excursion from Stanley. 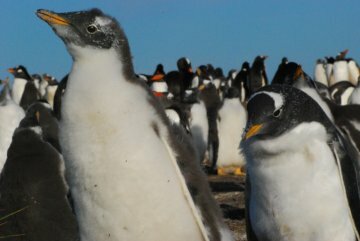 Chile holds several distinct penguin populations, most of which belong to the Magellanic, or jackass (named for the braying sound they make) species. They live in burrows and peer out — first with one eye, then the other — in areas such as Isla Magdalena, which lies a ferry ride away from the southern city of Punta Arenas, and near Seno Otway, just 70 km from the same city. Humbolt penguins are found in the north, and their habitat also extends into Peru. Most of Argentina’s penguin sightings take place near Punta Tombo, 180 km from the nature-rich town of Puerto Madryn. Close to 500,000 pairs of Magellanic penguins return here every year. They’re rather tame, and may even peck at your feet as you crouch down to get a photo. It goes without saying that you shouldn’t touch or feed them. After Uluru, the fairy penguin’s “parade” at nightfall on Phillip Island’s Summerland Beach is Australia’s most visited attraction. Annually, half a million tourists make the journey to witness the 16-inch, 2-pound penguins waddle their way up the beach every night. The island is an easy day trip from Melbourne. New Zealand is home to a variety of penguin species — the blue, erect-crested, fiordland, rockhopper, snares, and yellow-eyed — but most of them breed on outer islands that are difficult to visit. 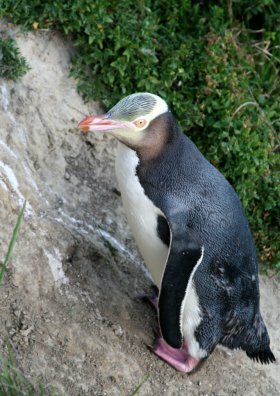 However, the Oamaru Blue Penguin Colony is just a 3-hour drive from Christchurch. This is New Zealand’s version of the penguin parade, and is best caught in the day’s dying light. The shyest and rarest of the New Zealand species, the yellow-eyed penguin can be seen nearby during daylight hours on the Otago coastline, from public hides. 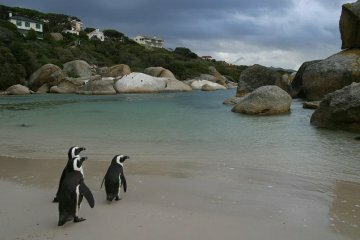 The best (though not only) place to see penguins in Africa is in South Africa, within suburban Capetown. 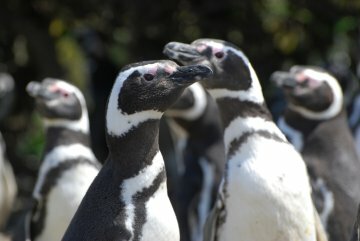 There are African penguin colonies on 24 islands belonging to both South Africa and Namibia, but it’s much easier to stake them out on Capetown’s Boulders Beach. Kayak trips from the Simon’s Town waterfront to Boulders Beach are also available. It should come as no surprise that an unexpected ecological penguin niche exists in the Galapagos. Here, you can see the northernmost of all species, the warm-water Galapagos penguin. A boat trip around/to the Galapagos will run you a few thousand dollars, plus airfare to Ecuador, but you might forget all that as you round Punta Albermarle on Isla Isabella, where the penguins can be seen cooling off with their wings outstretched and sharing rocks with the comically colored piqueros patas azules, or blue-footed boobies as they’re known in English. For more fun down under, check out the 5 Best Southern Hemisphere Ski Resorts.